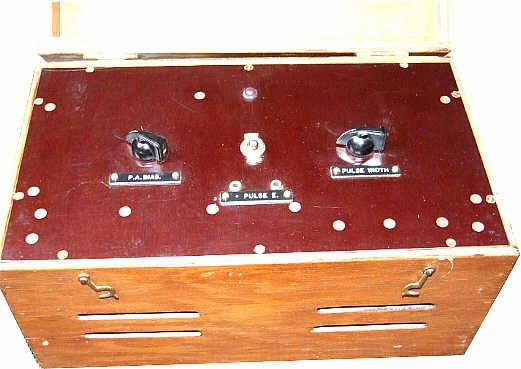 An original Wadden MkXV Transmitter in wood case. Many of those interested in collecting vintage military equipment are drawn to the Spy Set as the best example of things to acquire. Sometimes this urge to acquire such sets is spurred on solely by monetary factors but for dedicated collectors and those really interested in the history and technical aspects of such sets its always a delight to find new examples. 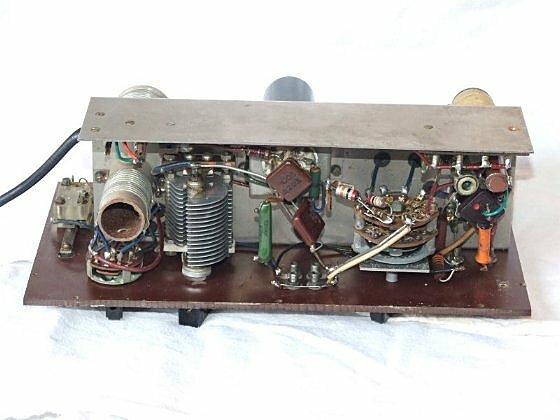 Just such good fortune befell me recently with the acquisition of a hitherto unseen set, the Mk XV transmitter, manufactured for MI6 and used by SOE as the first clandestine set into occupied Europe. The numbering system used by the military forces seems to be one designed to confuse the enemy, where are the other 14 models of set if this is the 15th. 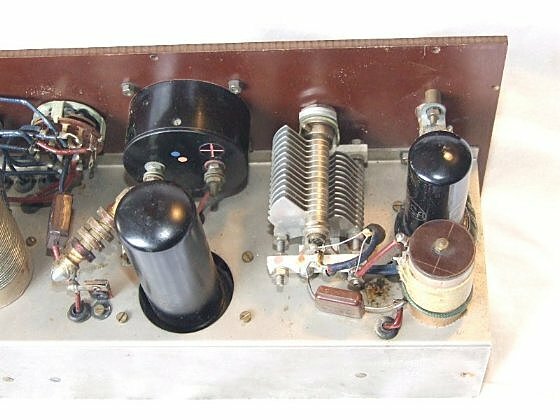 The Mk XV transmitter uses two valves, 6F6 oscillator and 6L6 PA stage. The set has three bands and can work in the range 3.5 to 16 Mhz, the PA stage acting as a doubler on the higher ranges. 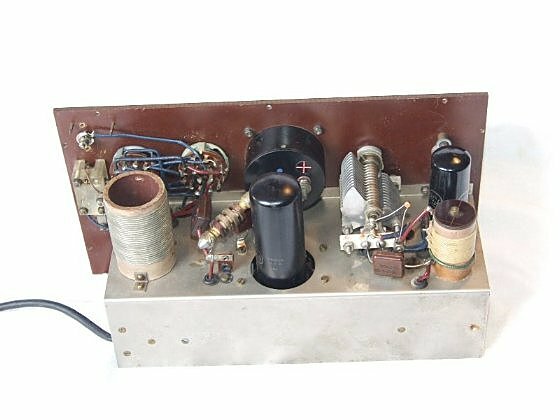 The matching receiver, housed in a slightly smaller box, uses three valves and is a simple regenerative receiver, tuning 3 to 13 Mhz in one band. 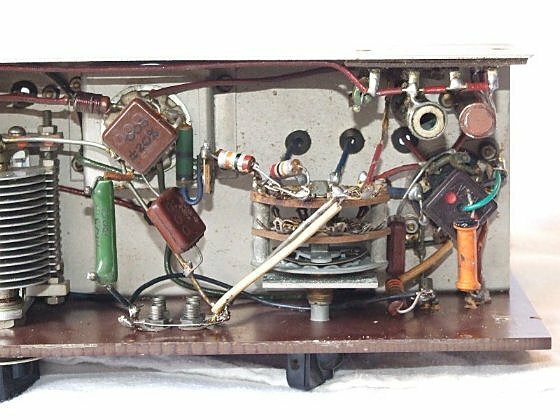 Pierre writes in his book that the Mk XV was made around 1938 and constructed from commercial components available to the radio amateur at the time. Two suitcases were needed to carry the complete station, the power supply for the system was housed in a metal container. Having only ever read about this set in Pierre Lorains book and having seen the only other example know in the Army Museum in Paris, France, it was with great delight that the unit was discovered, untended and unloved at a rally. The front panel of these sets must have been lacquered but was now in a poor state, peeling and coming off in flakes. I have since removed most of the dead lacquer, it had to be done carefully else the lettering would have gone as well, the lettering is not engraved, it is just silk screen printed on top of the panel. I have also removed a badly fitted Belling Lee coaxial socket and replaced it with the single pin socket, like the xtal and key sockets. Note though that there is no earth connection ? a strange feature for a set designed to be fed with a single wire aerial. Some mindless idiot owner before had drilled two holes in the front panel just below the original xtal sockets, so as to insert smaller xtal types (Hc/6) and when one looked inside the pins of the new xtal simply pressed against the existing wiring underneath ! 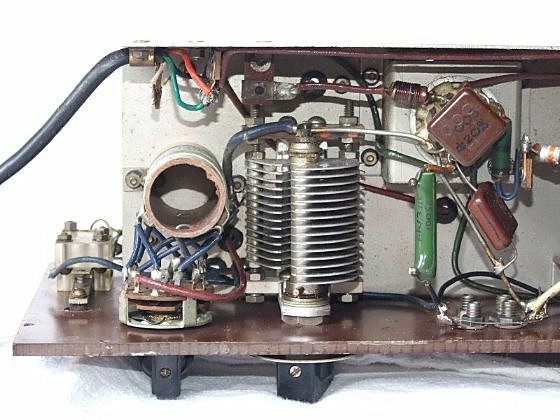 The violator had also added two 1/4 inch jacks, thankfully on the side, which were wired to key the oscillator or screen grid of the pa. These have since been removed and the wiring returned to original condition. 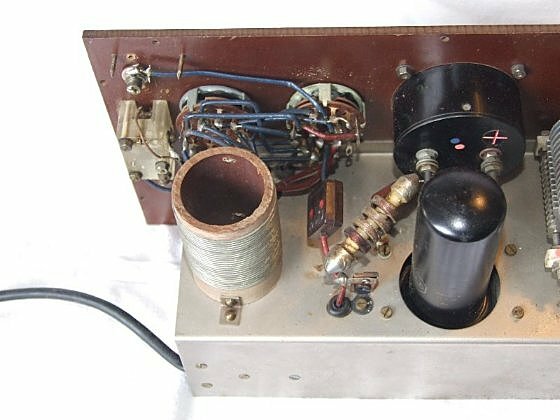 After a careful check on the resistances of ht to ground and various capacitors a supply was connected to the set. A xtal of 3576 was inserted and ht applied. 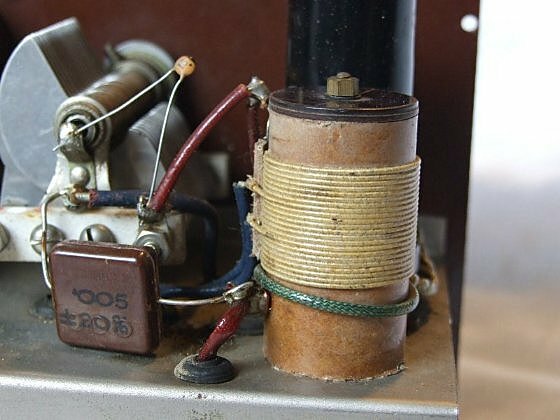 I found that the tuning of the oscillator stage was just at its limit, the specification for the set states 3.5 to 16 Mhz but it may be that ageing has altered that slightly. I added a 10pf capacitor to the oscillator tank and the circuit just peaked at maximum capacity. The PA was tuned and the correct tap selected on the PA tank to match into the shack aerial system. With 350v on the ht a good 15 watt of RF was obtained and the keyed note was very good. No chirp and no pulling at all was evident. Now the other unknown item, acquired from the same source at the same time. The unknown box, two knobs and an on/off switch ? What is it ? It's housed in the same type and style of box as the Mk XV, same small connectors, same type and colour of front panel. Inside are two transformers, three valves (missing) and components. I have no idea what "Pulse" refers to but, with the valves missing and no indication inside as to their types it's impossible to attempt to get the unit fired up, if you look back at the Mk XV, the two sockets below the External key ones are additions, the Mk XV did not originally have these. If you look carefully you may be able to see a + and - scratched below the two new sockets. Now look at the Pulser unit, it's two sockets are marked + and E (- ?) so, could there be a connection there. 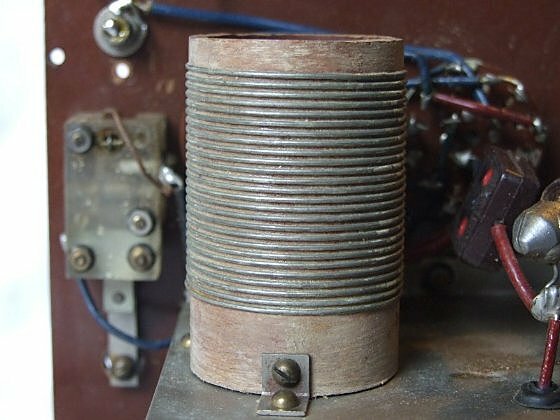 Could the Pulse box be used to key the transmitter in some fashion, maybe to serve as a beacon transmitter ? Both units are obviously built be the same company at similar times. As both surfaced together the connection and interest deepens. In the book on Resistance sets by Lorain he states that the Mk XV was made from commercial components available to the amateur market at the time. 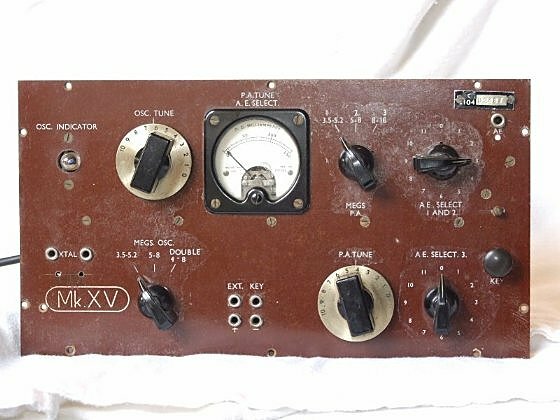 Given the rarity of the Mk XV I am contemplating having a replica box made for the receiver, then build a replica rx to match the tx, even if its just the front panel. I have never seen another example,except the one in Paris Army museum,so it should prove an interesting talking point when displayed.